I find the following charts to be disturbing. 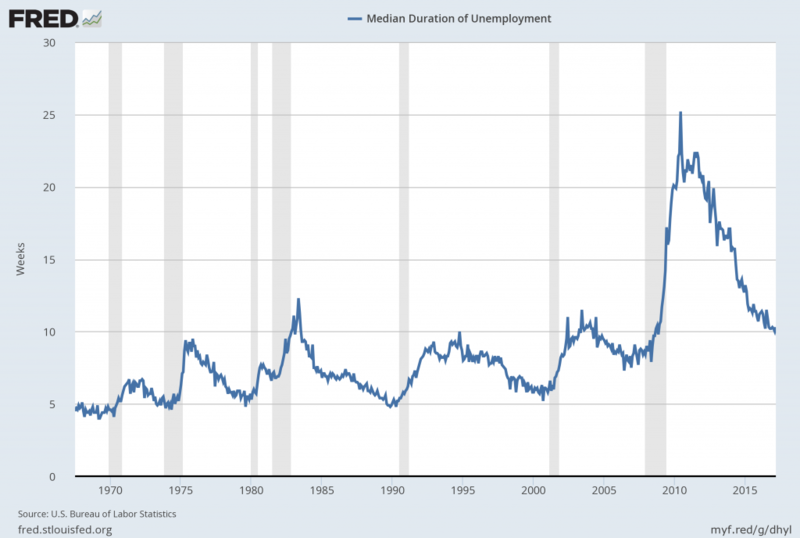 These charts would be disturbing at any point in the economic cycle; that they (on average) depict such a tenuous situation now – 115 months after the official (as per the September 20, 2010 NBER BCDC announcement) June 2009 end of the recession – is especially notable. US. 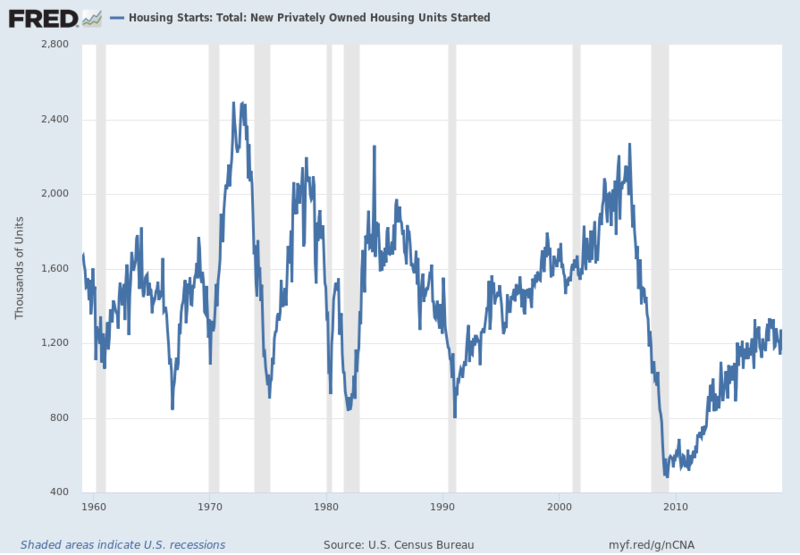 Bureau of the Census, Housing Starts: Total: New Privately Owned Housing Units Started [HOUST], retrieved from FRED, Federal Reserve Bank of St. Louis https://research.stlouisfed.org/fred2/series/HOUST/, January 15, 2019. US. 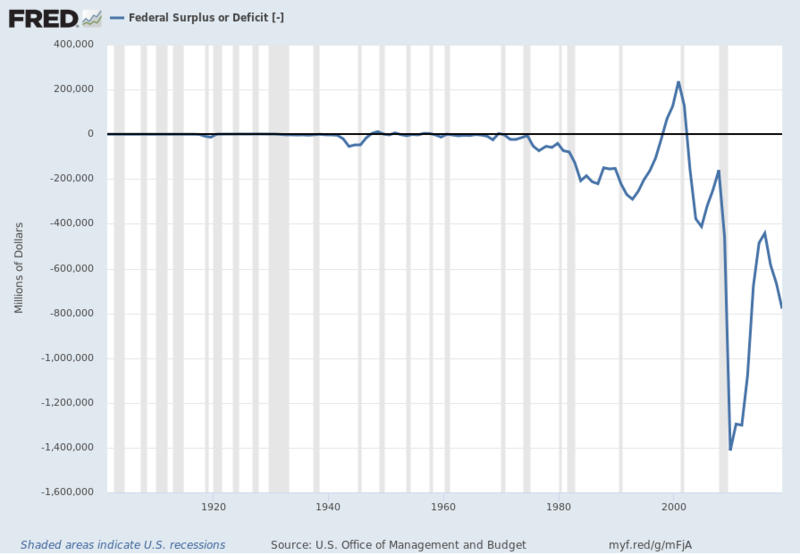 Office of Management and Budget, Federal Surplus or Deficit [-] [FYFSD], retrieved from FRED, Federal Reserve Bank of St. Louis https://research.stlouisfed.org/fred2/series/FYFSD/, January 15, 2019. US. 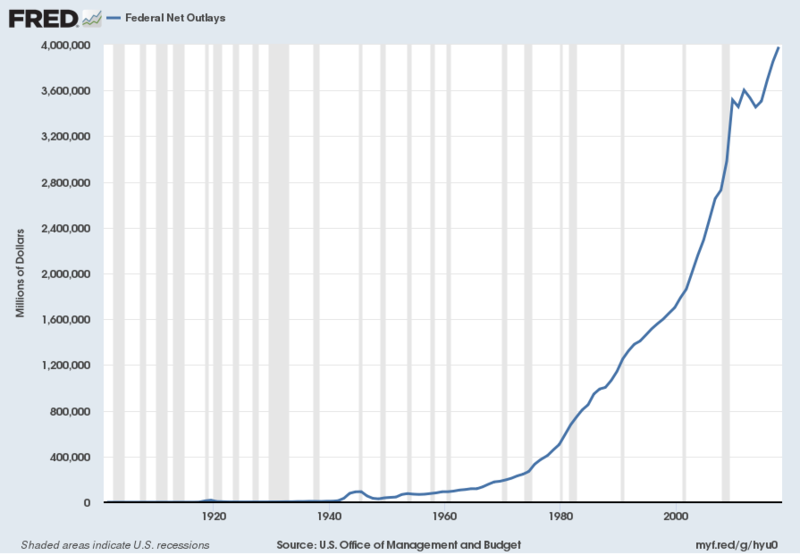 Office of Management and Budget, Federal Net Outlays [FYONET], retrieved from FRED, Federal Reserve Bank of St. Louis https://research.stlouisfed.org/fred2/series/FYONET/, January 15, 2019. US. 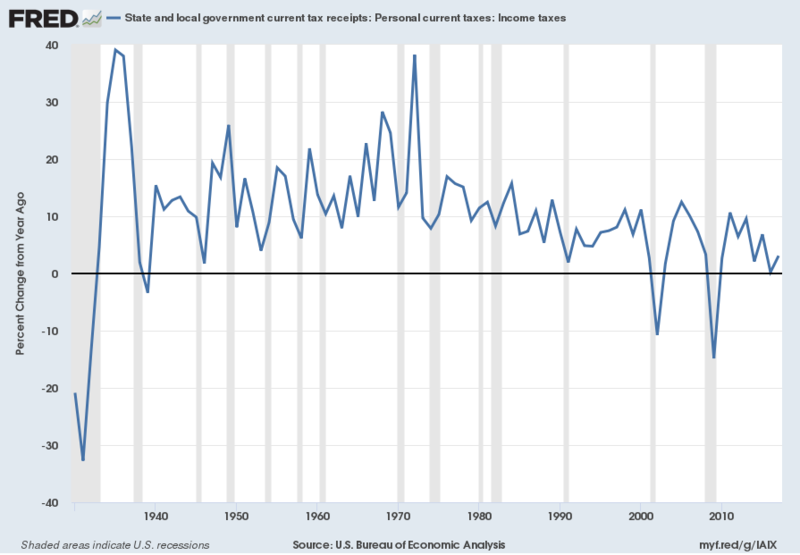 Bureau of Economic Analysis, State and local government current tax receipts: Personal current taxes: Income taxes [ASLPITAX], retrieved from FRED, Federal Reserve Bank of St. Louis https://research.stlouisfed.org/fred2/series/ASLPITAX/, January 15, 2019. 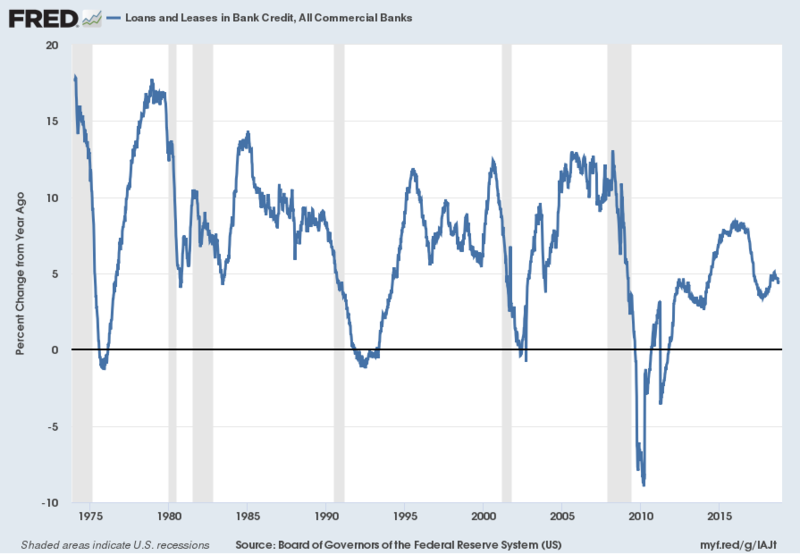 Board of Governors of the Federal Reserve System (US), Loans and Leases in Bank Credit, All Commercial Banks [TOTLL], retrieved from FRED, Federal Reserve Bank of St. Louis https://research.stlouisfed.org/fred2/series/TOTLL/, January 15, 2019. 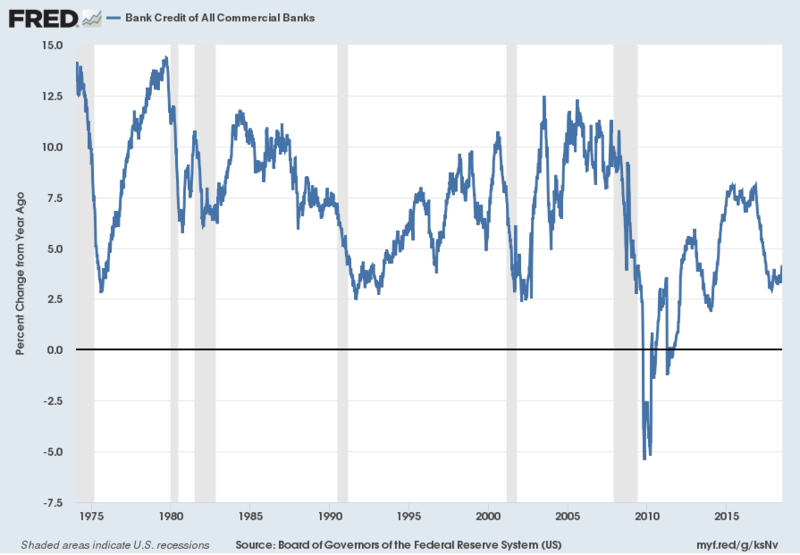 Board of Governors of the Federal Reserve System (US), Bank Credit of All Commercial Banks [TOTBKCR], retrieved from FRED, Federal Reserve Bank of St. Louis https://research.stlouisfed.org/fred2/series/TOTBKCR/, January 15, 2019. 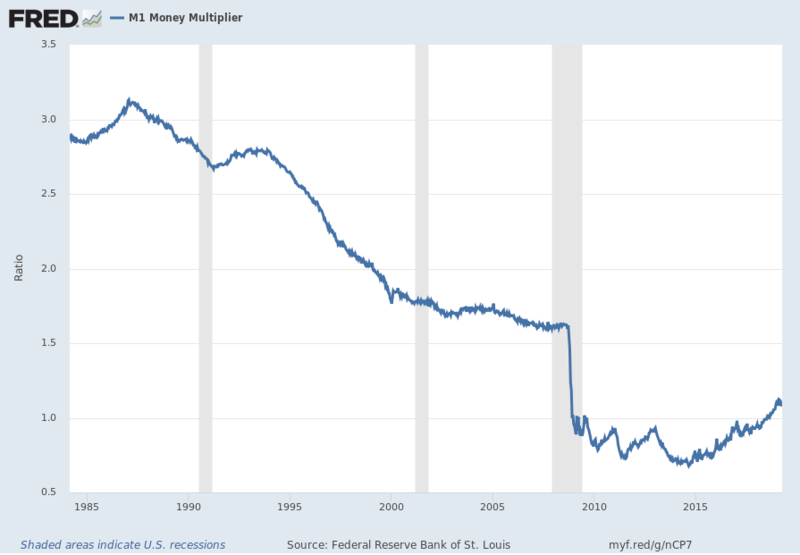 Federal Reserve Bank of St. Louis, M1 Money Multiplier [MULT], retrieved from FRED, Federal Reserve Bank of St. Louis https://research.stlouisfed.org/fred2/series/MULT/, January 15, 2019. US. 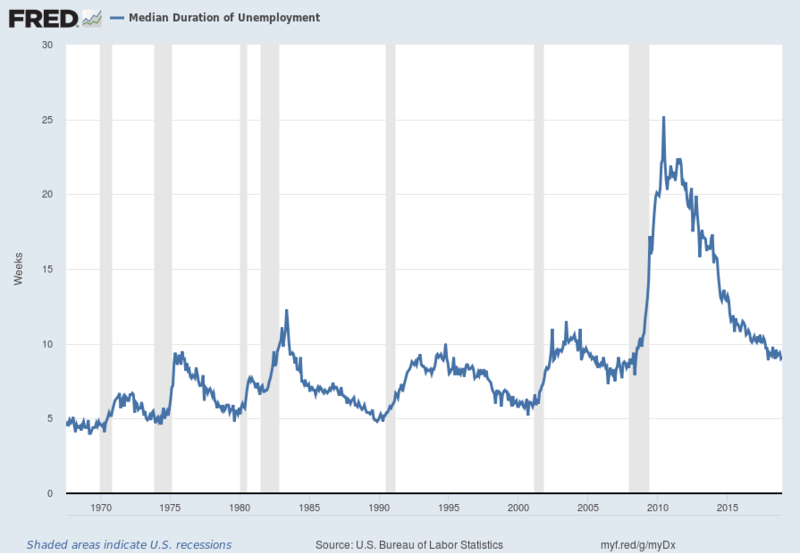 Bureau of Labor Statistics, Median Duration of Unemployment [UEMPMED], retrieved from FRED, Federal Reserve Bank of St. Louis https://research.stlouisfed.org/fred2/series/UEMPMED/, January 15, 2019. US. 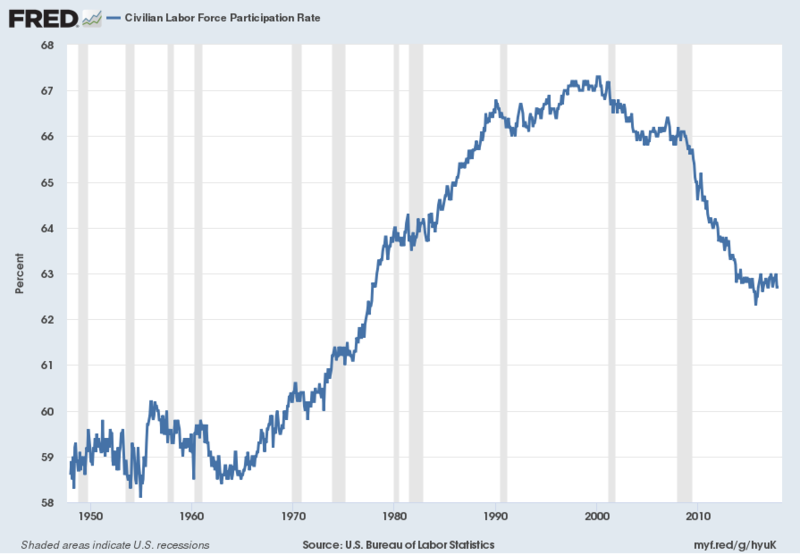 Bureau of Labor Statistics, Civilian Labor Force Participation Rate [CIVPART], retrieved from FRED, Federal Reserve Bank of St. Louis https://research.stlouisfed.org/fred2/series/CIVPART/, January 15, 2019. Federal Reserve Bank of Chicago, Chicago Fed National Activity Index: Three Month Moving Average [CFNAIMA3], retrieved from FRED, Federal Reserve Bank of St. Louis https://research.stlouisfed.org/fred2/series/CFNAIMA3/, January 15, 2019. This entry was posted in Uncategorized and tagged disturbing charts on January 16, 2019 by Ted Kavadas. I find the following charts to be disturbing. These charts would be disturbing at any point in the economic cycle; that they (on average) depict such a tenuous situation now – 112 months after the official (as per the September 20, 2010 NBER BCDC announcement) June 2009 end of the recession – is especially notable. US. 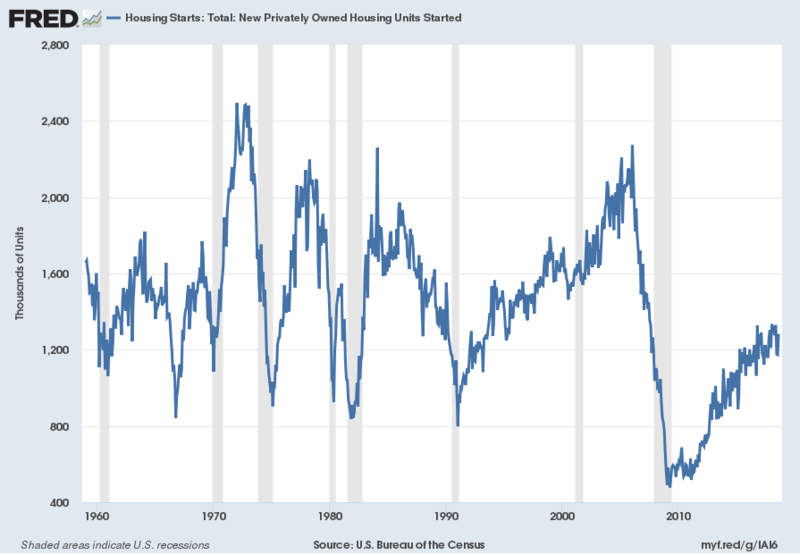 Bureau of the Census, Housing Starts: Total: New Privately Owned Housing Units Started [HOUST], retrieved from FRED, Federal Reserve Bank of St. Louis https://research.stlouisfed.org/fred2/series/HOUST/, October 15, 2018. US. Office of Management and Budget, Federal Surplus or Deficit [-] [FYFSD], retrieved from FRED, Federal Reserve Bank of St. Louis https://research.stlouisfed.org/fred2/series/FYFSD/, October 15, 2018. US. 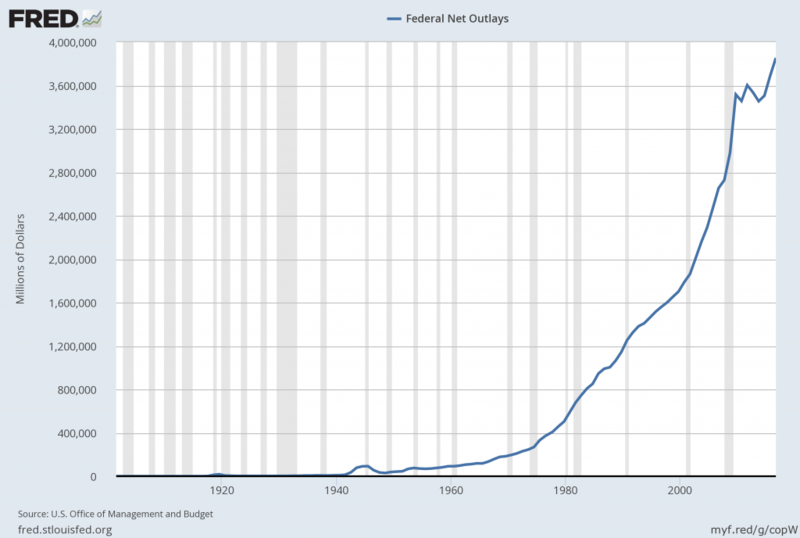 Office of Management and Budget, Federal Net Outlays [FYONET], retrieved from FRED, Federal Reserve Bank of St. Louis https://research.stlouisfed.org/fred2/series/FYONET/, October 15, 2018. US. 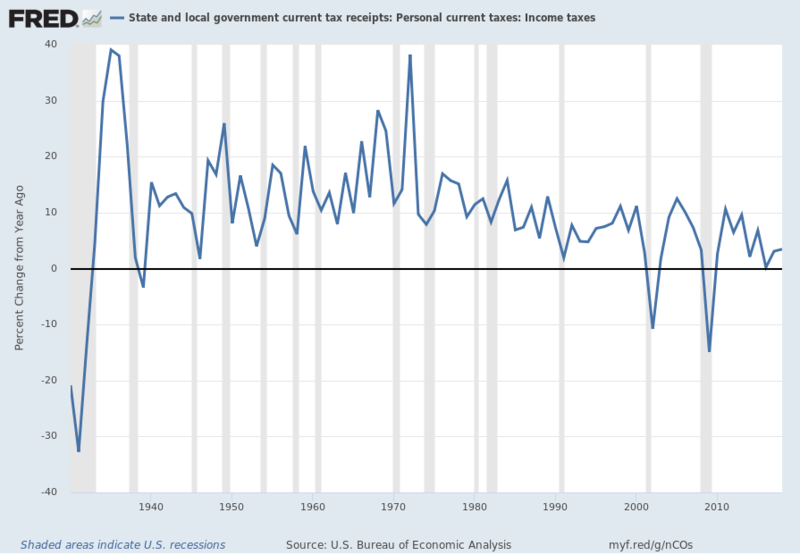 Bureau of Economic Analysis, State and local government current tax receipts: Personal current taxes: Income taxes [ASLPITAX], retrieved from FRED, Federal Reserve Bank of St. Louis https://research.stlouisfed.org/fred2/series/ASLPITAX/, October 15, 2018. Board of Governors of the Federal Reserve System (US), Loans and Leases in Bank Credit, All Commercial Banks [TOTLL], retrieved from FRED, Federal Reserve Bank of St. Louis https://research.stlouisfed.org/fred2/series/TOTLL/, October 15, 2018. 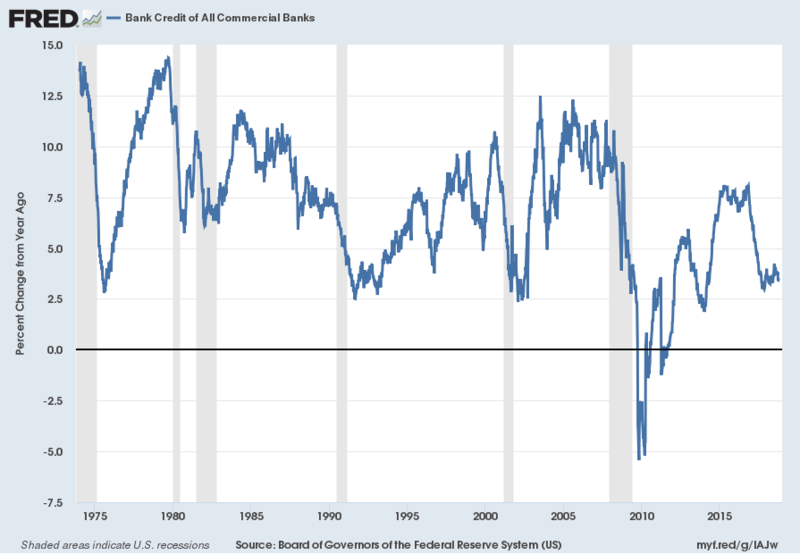 Board of Governors of the Federal Reserve System (US), Bank Credit of All Commercial Banks [TOTBKCR], retrieved from FRED, Federal Reserve Bank of St. Louis https://research.stlouisfed.org/fred2/series/TOTBKCR/, October 15, 2018. 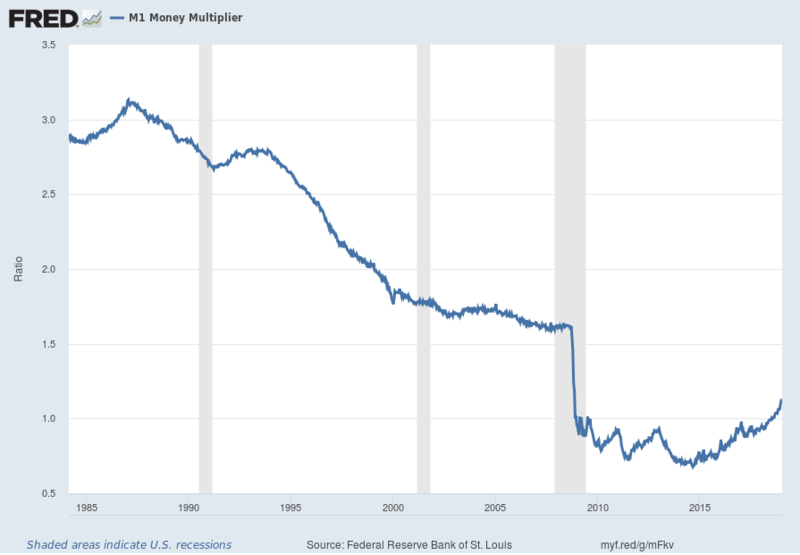 Federal Reserve Bank of St. Louis, M1 Money Multiplier [MULT], retrieved from FRED, Federal Reserve Bank of St. Louis https://research.stlouisfed.org/fred2/series/MULT/, October 15, 2018. US. 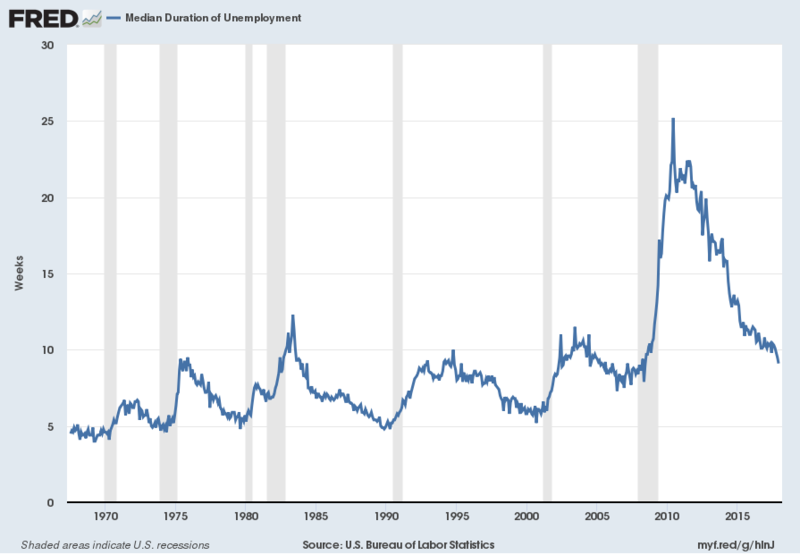 Bureau of Labor Statistics, Median Duration of Unemployment [UEMPMED], retrieved from FRED, Federal Reserve Bank of St. Louis https://research.stlouisfed.org/fred2/series/UEMPMED/, October 15, 2018. US. 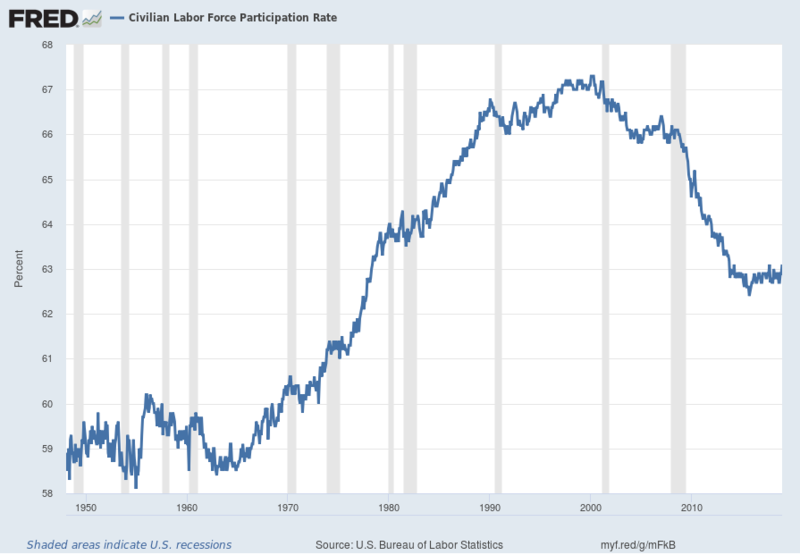 Bureau of Labor Statistics, Civilian Labor Force Participation Rate [CIVPART], retrieved from FRED, Federal Reserve Bank of St. Louis https://research.stlouisfed.org/fred2/series/CIVPART/, October 15, 2018. 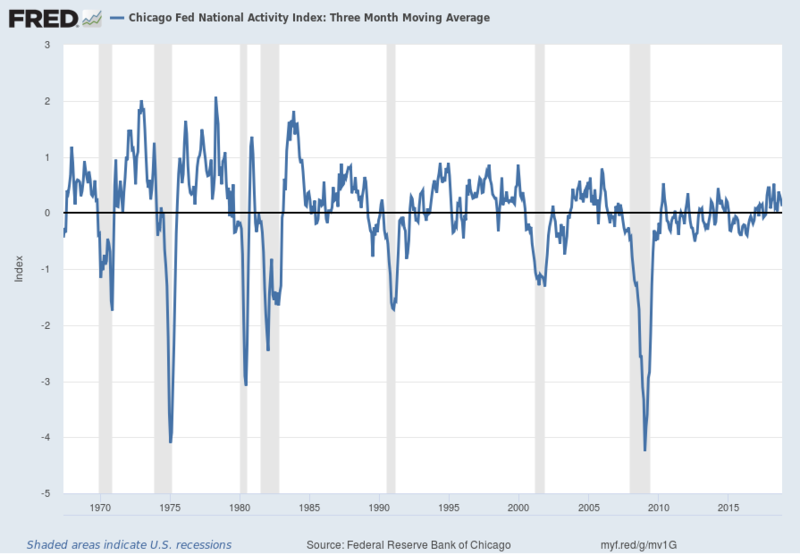 Federal Reserve Bank of Chicago, Chicago Fed National Activity Index: Three Month Moving Average [CFNAIMA3], retrieved from FRED, Federal Reserve Bank of St. Louis https://research.stlouisfed.org/fred2/series/CFNAIMA3/, October 15, 2018. This entry was posted in Uncategorized and tagged disturbing charts on October 16, 2018 by Ted Kavadas. I find the following charts to be disturbing. These charts would be disturbing at any point in the economic cycle; that they (on average) depict such a tenuous situation now – 109 months after the official (as per the September 20, 2010 NBER BCDC announcement) June 2009 end of the recession – is especially notable. US. Bureau of the Census, Housing Starts: Total: New Privately Owned Housing Units Started [HOUST], retrieved from FRED, Federal Reserve Bank of St. Louis https://research.stlouisfed.org/fred2/series/HOUST/, July 13, 2018. US. Office of Management and Budget, Federal Surplus or Deficit [-] [FYFSD], retrieved from FRED, Federal Reserve Bank of St. Louis https://research.stlouisfed.org/fred2/series/FYFSD/, July 13, 2018. US. 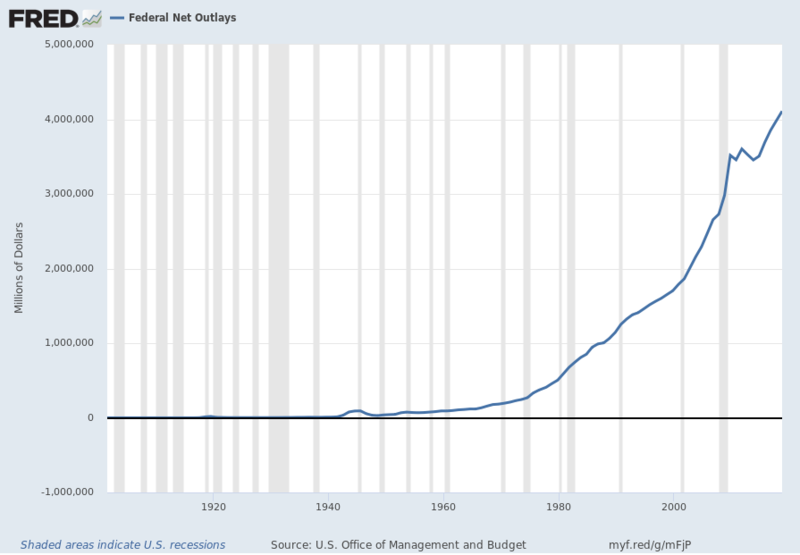 Office of Management and Budget, Federal Net Outlays [FYONET], retrieved from FRED, Federal Reserve Bank of St. Louis https://research.stlouisfed.org/fred2/series/FYONET/, July 13, 2018. US. 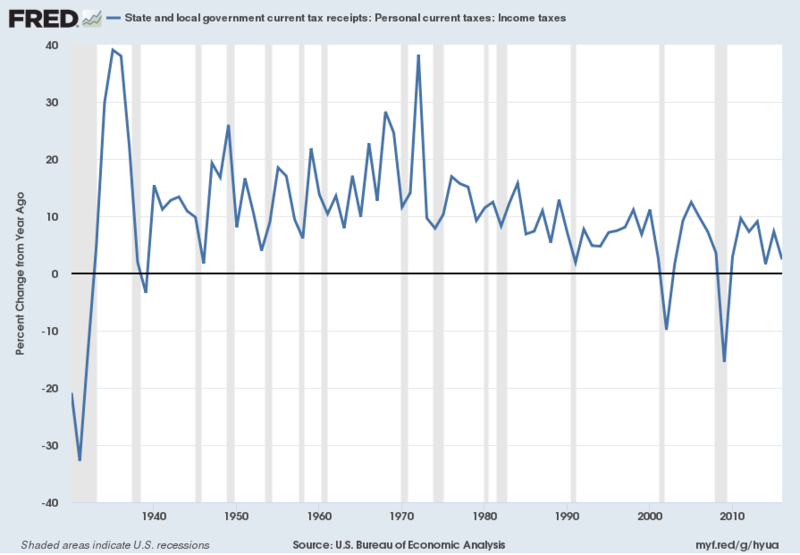 Bureau of Economic Analysis, State and local government current tax receipts: Personal current taxes: Income taxes [ASLPITAX], retrieved from FRED, Federal Reserve Bank of St. Louis https://research.stlouisfed.org/fred2/series/ASLPITAX/, July 13, 2018. 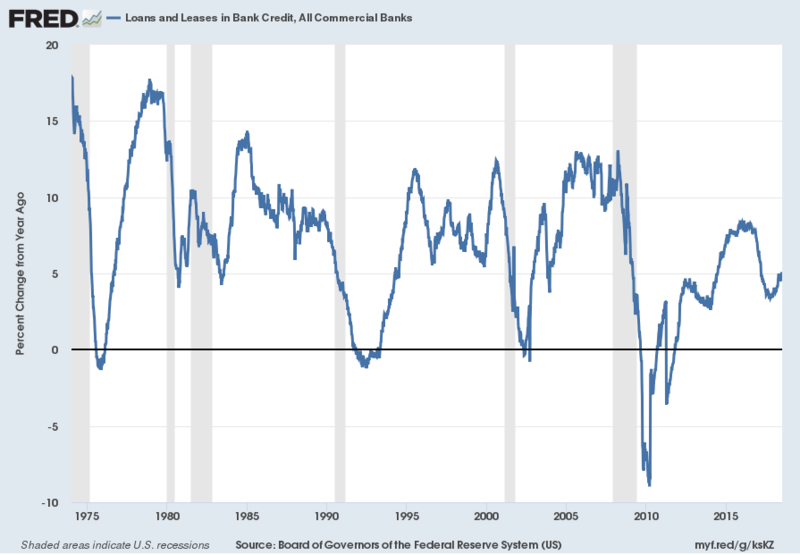 Board of Governors of the Federal Reserve System (US), Loans and Leases in Bank Credit, All Commercial Banks [TOTLL], retrieved from FRED, Federal Reserve Bank of St. Louis https://research.stlouisfed.org/fred2/series/TOTLL/, July 13, 2018. 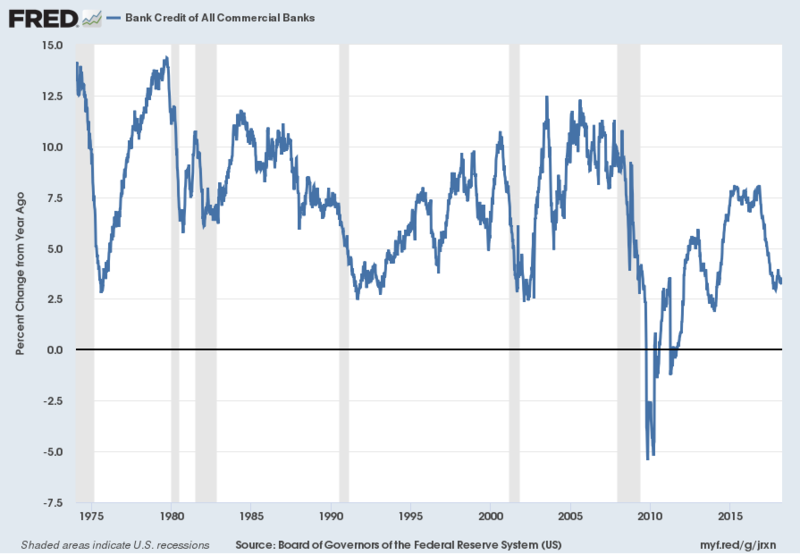 Board of Governors of the Federal Reserve System (US), Bank Credit of All Commercial Banks [TOTBKCR], retrieved from FRED, Federal Reserve Bank of St. Louis https://research.stlouisfed.org/fred2/series/TOTBKCR/, July 13, 2018. Federal Reserve Bank of St. Louis, M1 Money Multiplier [MULT], retrieved from FRED, Federal Reserve Bank of St. Louis https://research.stlouisfed.org/fred2/series/MULT/, July 13, 2018. US. 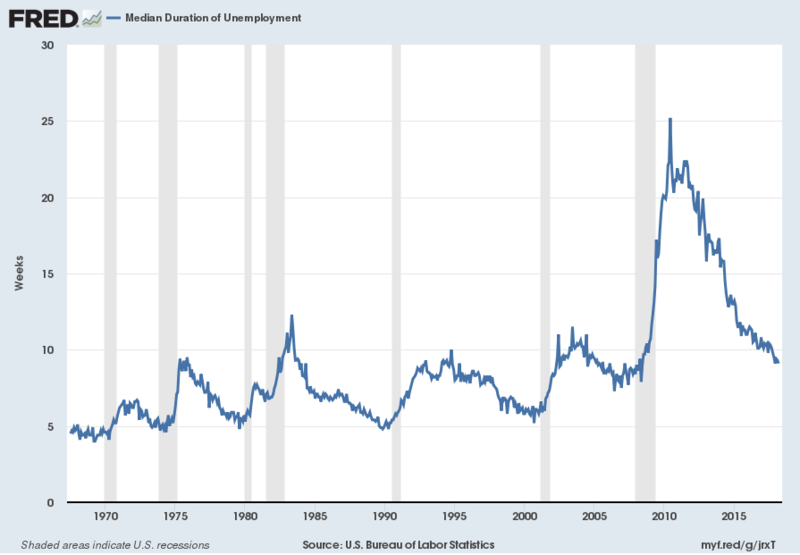 Bureau of Labor Statistics, Median Duration of Unemployment [UEMPMED], retrieved from FRED, Federal Reserve Bank of St. Louis https://research.stlouisfed.org/fred2/series/UEMPMED/, July 6, 2018. US. 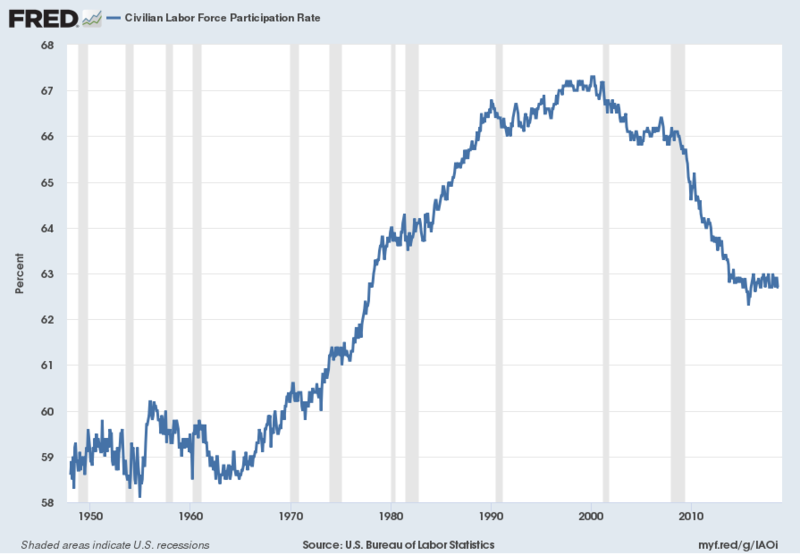 Bureau of Labor Statistics, Civilian Labor Force Participation Rate [CIVPART], retrieved from FRED, Federal Reserve Bank of St. Louis https://research.stlouisfed.org/fred2/series/CIVPART/, July 15, 2018. Federal Reserve Bank of Chicago, Chicago Fed National Activity Index: Three Month Moving Average [CFNAIMA3], retrieved from FRED, Federal Reserve Bank of St. Louis https://research.stlouisfed.org/fred2/series/CFNAIMA3/, June 25, 2018. This entry was posted in Uncategorized and tagged disturbing charts on July 16, 2018 by Ted Kavadas. I find the following charts to be disturbing. These charts would be disturbing at any point in the economic cycle; that they (on average) depict such a tenuous situation now – 106 months after the official (as per the September 20, 2010 NBER BCDC announcement) June 2009 end of the recession – is especially notable. US. 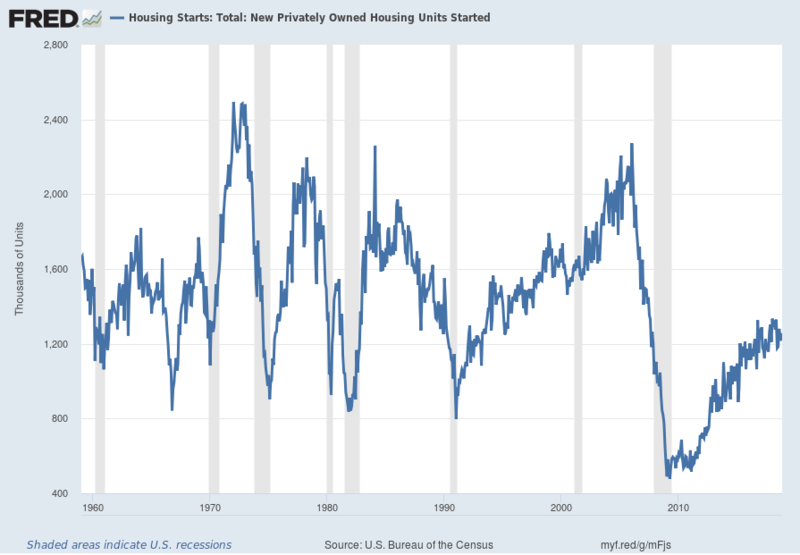 Bureau of the Census, Housing Starts: Total: New Privately Owned Housing Units Started [HOUST], retrieved from FRED, Federal Reserve Bank of St. Louis https://research.stlouisfed.org/fred2/series/HOUST/, April 13, 2018. US. Office of Management and Budget, Federal Surplus or Deficit [-] [FYFSD], retrieved from FRED, Federal Reserve Bank of St. Louis https://research.stlouisfed.org/fred2/series/FYFSD/, April 13, 2018. US. Office of Management and Budget, Federal Net Outlays [FYONET], retrieved from FRED, Federal Reserve Bank of St. Louis https://research.stlouisfed.org/fred2/series/FYONET/, April 13, 2018. US. 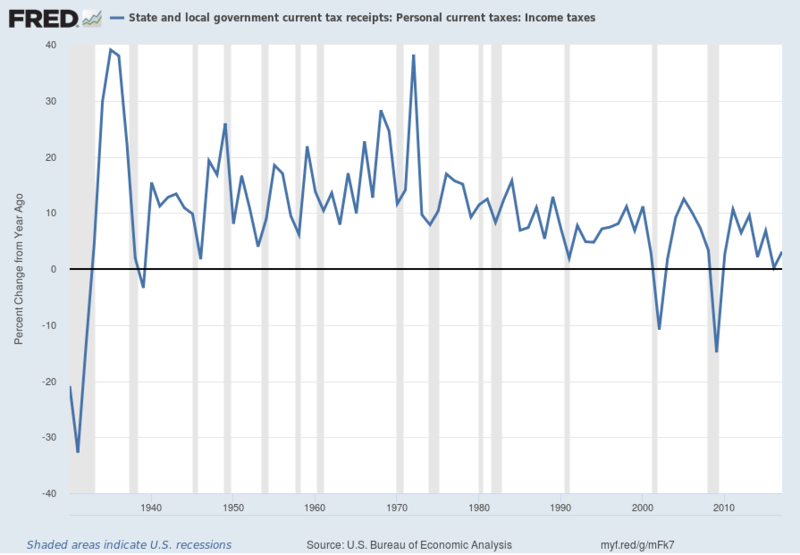 Bureau of Economic Analysis, State and local government current tax receipts: Personal current taxes: Income taxes [ASLPITAX], retrieved from FRED, Federal Reserve Bank of St. Louis https://research.stlouisfed.org/fred2/series/ASLPITAX/, April 13, 2018. 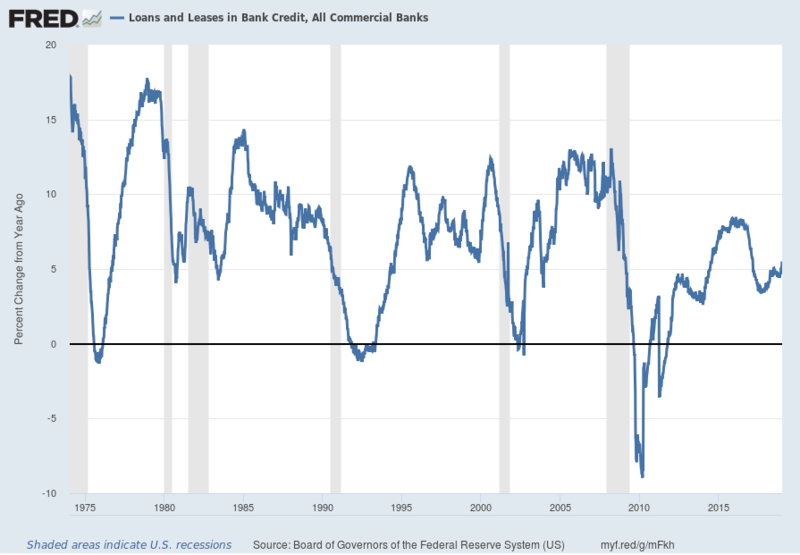 Board of Governors of the Federal Reserve System (US), Loans and Leases in Bank Credit, All Commercial Banks [TOTLL], retrieved from FRED, Federal Reserve Bank of St. Louis https://research.stlouisfed.org/fred2/series/TOTLL/, April 13, 2018. 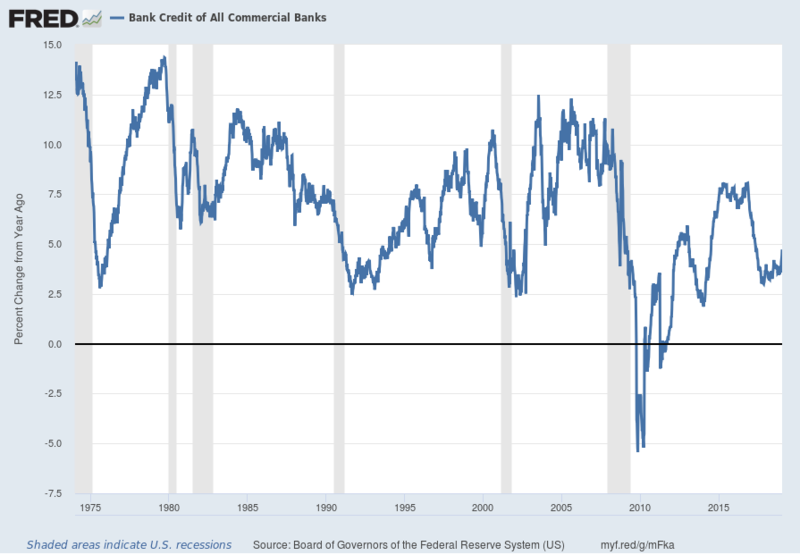 Board of Governors of the Federal Reserve System (US), Bank Credit of All Commercial Banks [TOTBKCR], retrieved from FRED, Federal Reserve Bank of St. Louis https://research.stlouisfed.org/fred2/series/TOTBKCR/, April 13, 2018. 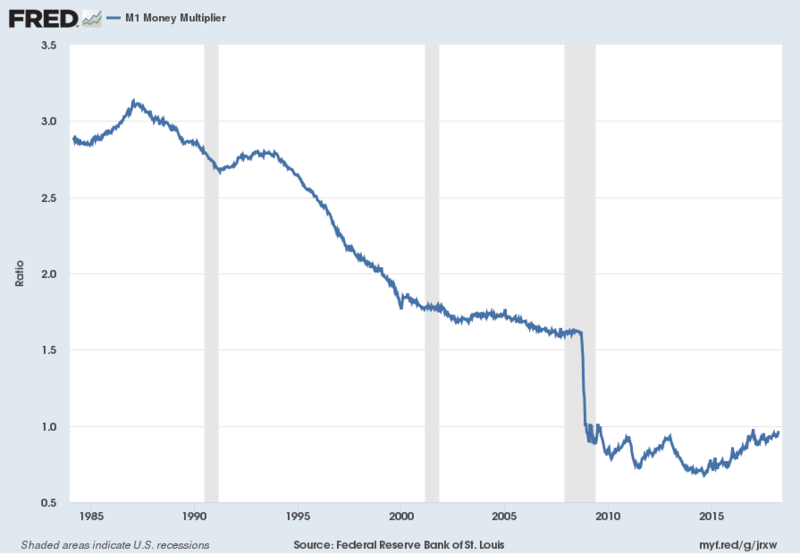 Federal Reserve Bank of St. Louis, M1 Money Multiplier [MULT], retrieved from FRED, Federal Reserve Bank of St. Louis https://research.stlouisfed.org/fred2/series/MULT/, April 13, 2018. US. 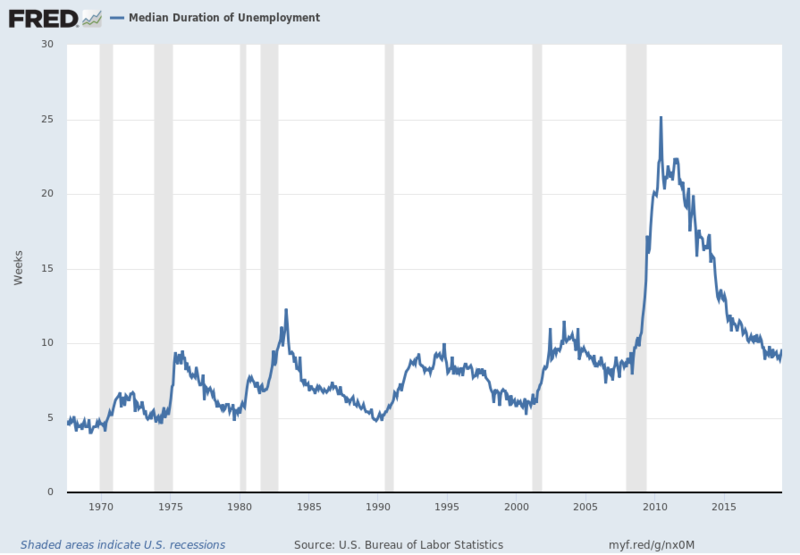 Bureau of Labor Statistics, Median Duration of Unemployment [UEMPMED], retrieved from FRED, Federal Reserve Bank of St. Louis https://research.stlouisfed.org/fred2/series/UEMPMED/, April 13, 2018. US. Bureau of Labor Statistics, Civilian Labor Force Participation Rate [CIVPART], retrieved from FRED, Federal Reserve Bank of St. Louis https://research.stlouisfed.org/fred2/series/CIVPART/, April 13, 2018. Federal Reserve Bank of Chicago, Chicago Fed National Activity Index: Three Month Moving Average [CFNAIMA3], retrieved from FRED, Federal Reserve Bank of St. Louis https://research.stlouisfed.org/fred2/series/CFNAIMA3/, April 13, 2018. This entry was posted in Uncategorized and tagged disturbing charts on April 16, 2018 by Ted Kavadas. I find the following charts to be disturbing. These charts would be disturbing at any point in the economic cycle; that they (on average) depict such a tenuous situation now – 103 months after the official (as per the September 20, 2010 NBER BCDC announcement) June 2009 end of the recession – is especially notable. US. 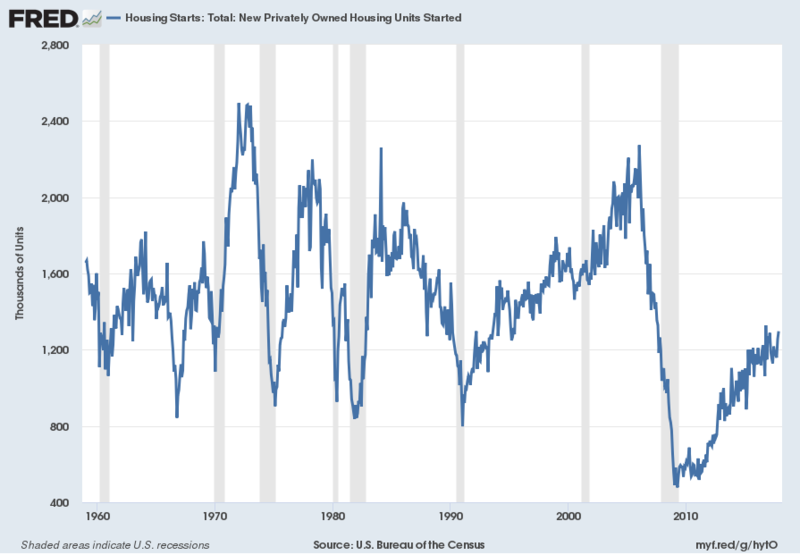 Bureau of the Census, Housing Starts: Total: New Privately Owned Housing Units Started [HOUST], retrieved from FRED, Federal Reserve Bank of St. Louis https://research.stlouisfed.org/fred2/series/HOUST/, January 16, 2018. US. Office of Management and Budget, Federal Surplus or Deficit [-] [FYFSD], retrieved from FRED, Federal Reserve Bank of St. Louis https://research.stlouisfed.org/fred2/series/FYFSD/, January 16, 2018. US. Office of Management and Budget, Federal Net Outlays [FYONET], retrieved from FRED, Federal Reserve Bank of St. Louis https://research.stlouisfed.org/fred2/series/FYONET/, January 16, 2018. US. 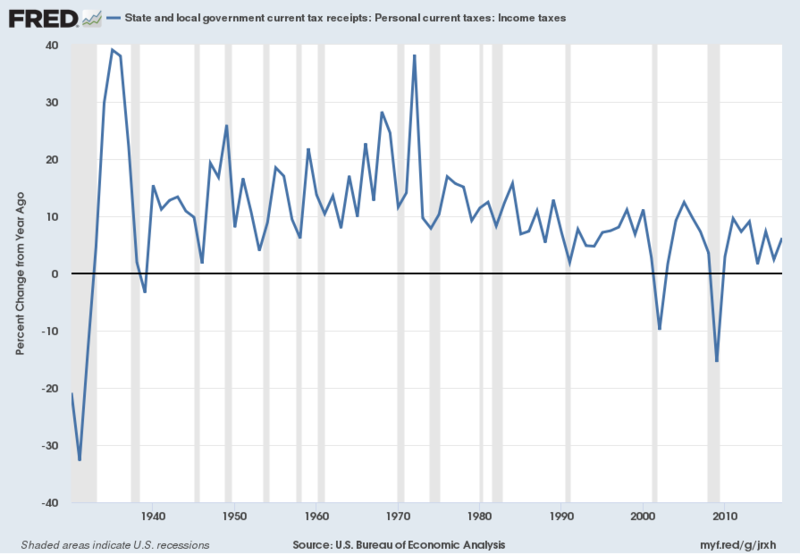 Bureau of Economic Analysis, State and local government current tax receipts: Personal current taxes: Income taxes [ASLPITAX], retrieved from FRED, Federal Reserve Bank of St. Louis https://research.stlouisfed.org/fred2/series/ASLPITAX/, January 16, 2018. 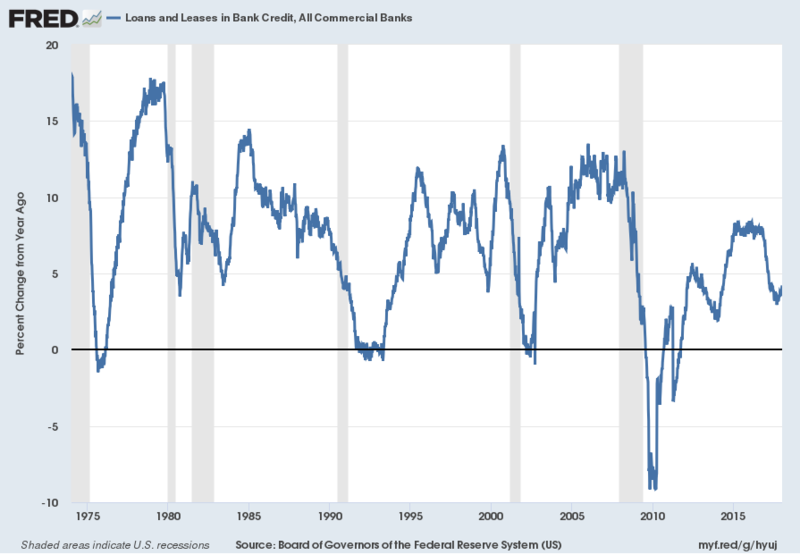 Board of Governors of the Federal Reserve System (US), Loans and Leases in Bank Credit, All Commercial Banks [TOTLL], retrieved from FRED, Federal Reserve Bank of St. Louis https://research.stlouisfed.org/fred2/series/TOTLL/, January 16, 2018. 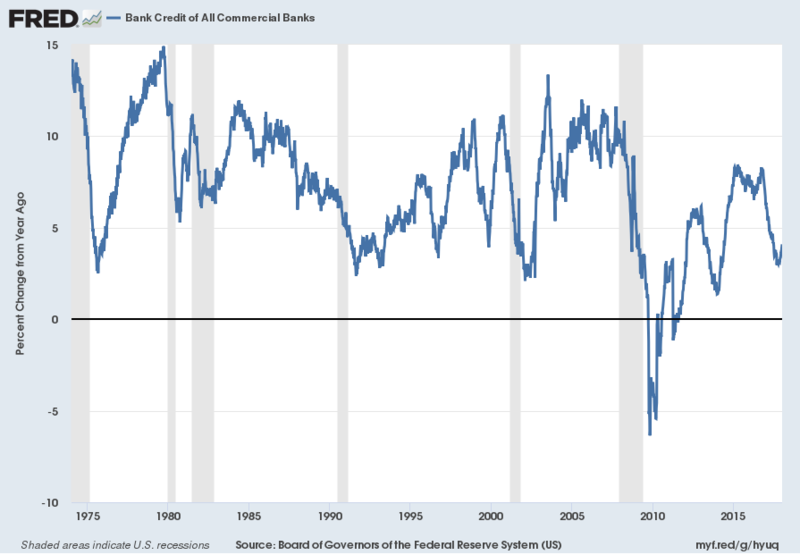 Board of Governors of the Federal Reserve System (US), Bank Credit of All Commercial Banks [TOTBKCR], retrieved from FRED, Federal Reserve Bank of St. Louis https://research.stlouisfed.org/fred2/series/TOTBKCR/, January 16, 2018. Federal Reserve Bank of St. Louis, M1 Money Multiplier [MULT], retrieved from FRED, Federal Reserve Bank of St. Louis https://research.stlouisfed.org/fred2/series/MULT/, January 16, 2018. US. 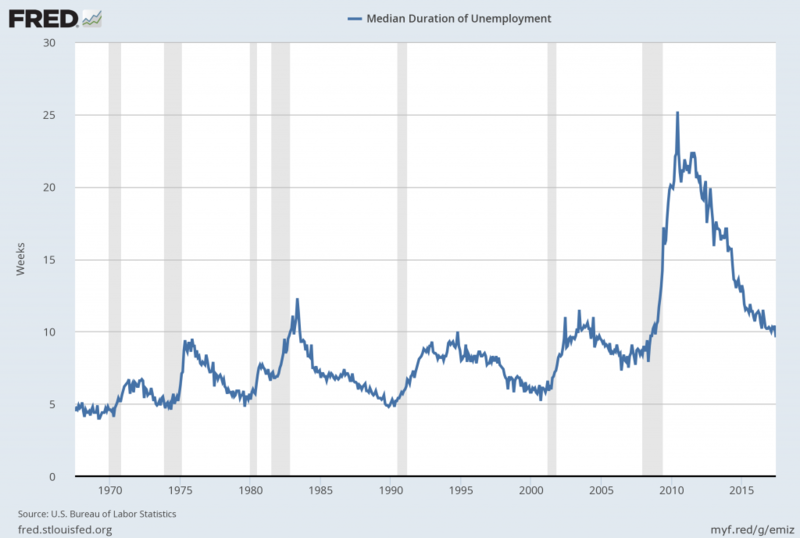 Bureau of Labor Statistics, Median Duration of Unemployment [UEMPMED], retrieved from FRED, Federal Reserve Bank of St. Louis https://research.stlouisfed.org/fred2/series/UEMPMED/, January 16, 2018. US. Bureau of Labor Statistics, Civilian Labor Force Participation Rate [CIVPART], retrieved from FRED, Federal Reserve Bank of St. Louis https://research.stlouisfed.org/fred2/series/CIVPART/, January 16, 2018. 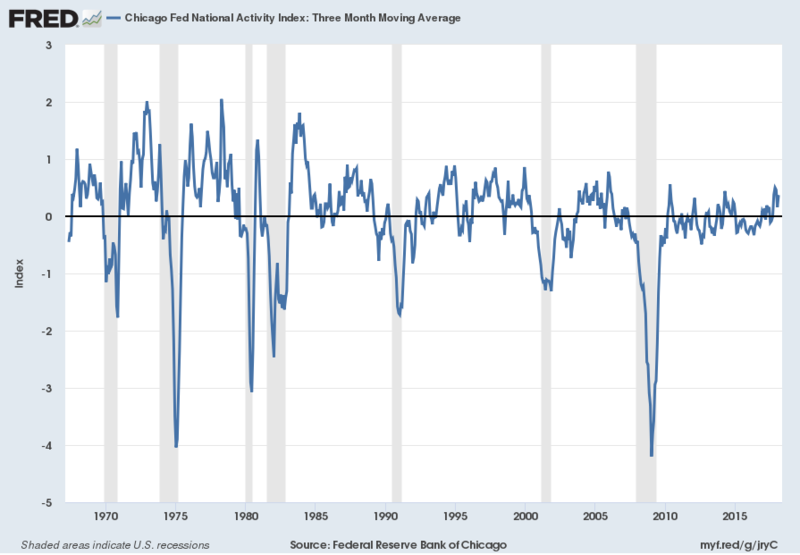 Federal Reserve Bank of Chicago, Chicago Fed National Activity Index: Three Month Moving Average [CFNAIMA3], retrieved from FRED, Federal Reserve Bank of St. Louis https://research.stlouisfed.org/fred2/series/CFNAIMA3/, January 16, 2018. This entry was posted in Uncategorized and tagged disturbing charts on January 17, 2018 by Ted Kavadas. I find the following charts to be disturbing. These charts would be disturbing at any point in the economic cycle; that they (on average) depict such a tenuous situation now – 100 months after the official (as per the September 20, 2010 NBER BCDC announcement) June 2009 end of the recession – is especially notable. US. Bureau of the Census, Housing Starts: Total: New Privately Owned Housing Units Started [HOUST], retrieved from FRED, Federal Reserve Bank of St. Louis https://research.stlouisfed.org/fred2/series/HOUST/, October 14, 2017. US. 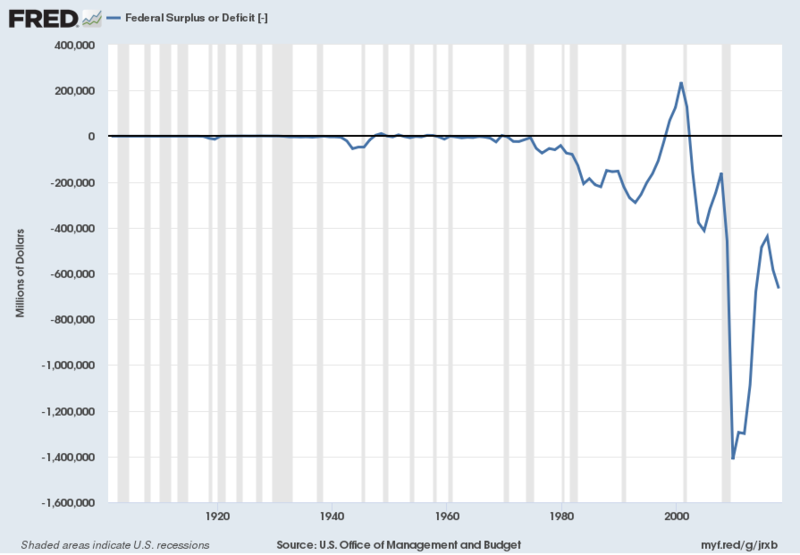 Office of Management and Budget, Federal Surplus or Deficit [-] [FYFSD], retrieved from FRED, Federal Reserve Bank of St. Louis https://research.stlouisfed.org/fred2/series/FYFSD/, October 14, 2017. US. Office of Management and Budget, Federal Net Outlays [FYONET], retrieved from FRED, Federal Reserve Bank of St. Louis https://research.stlouisfed.org/fred2/series/FYONET/, October 14, 2017. US. Bureau of Economic Analysis, State and local government current tax receipts: Personal current taxes: Income taxes [ASLPITAX], retrieved from FRED, Federal Reserve Bank of St. Louis https://research.stlouisfed.org/fred2/series/ASLPITAX/, October 14, 2017. 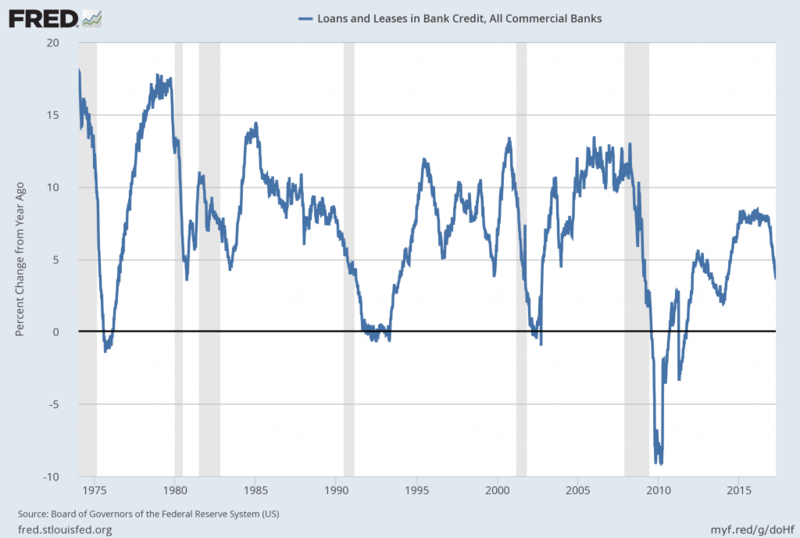 Board of Governors of the Federal Reserve System (US), Loans and Leases in Bank Credit, All Commercial Banks [TOTLL], retrieved from FRED, Federal Reserve Bank of St. Louis https://research.stlouisfed.org/fred2/series/TOTLL/, October 14, 2017. 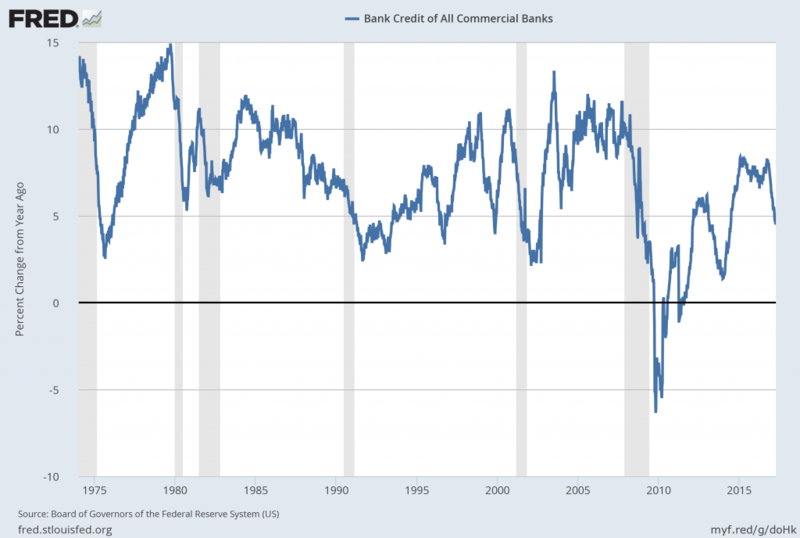 Board of Governors of the Federal Reserve System (US), Bank Credit of All Commercial Banks [TOTBKCR], retrieved from FRED, Federal Reserve Bank of St. Louis https://research.stlouisfed.org/fred2/series/TOTBKCR/, October 14, 2017. 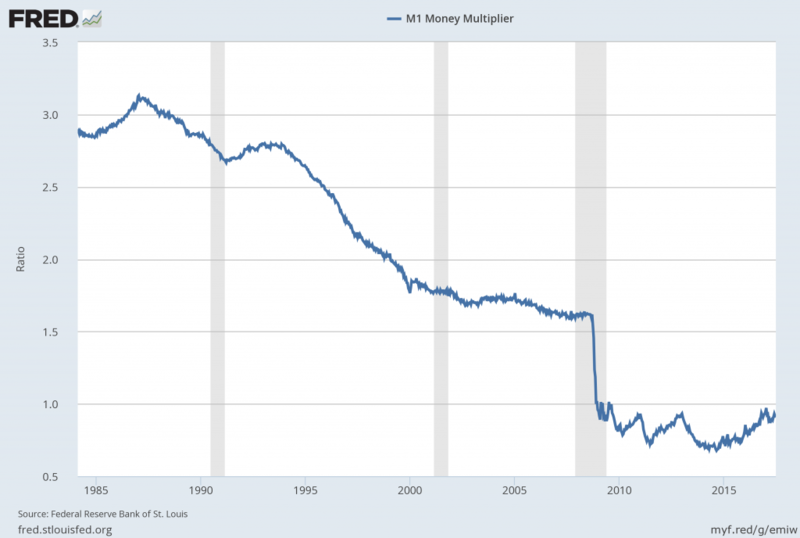 Federal Reserve Bank of St. Louis, M1 Money Multiplier [MULT], retrieved from FRED, Federal Reserve Bank of St. Louis https://research.stlouisfed.org/fred2/series/MULT/, October 14, 2017. US. 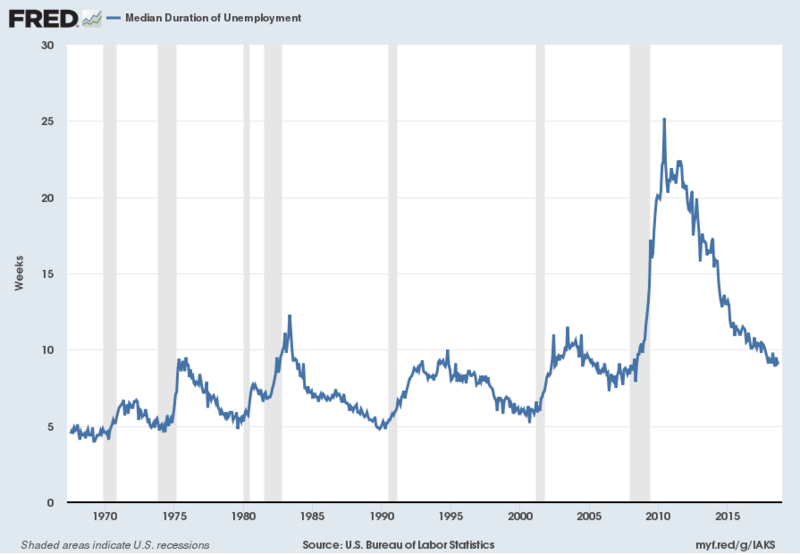 Bureau of Labor Statistics, Median Duration of Unemployment [UEMPMED], retrieved from FRED, Federal Reserve Bank of St. Louis https://research.stlouisfed.org/fred2/series/UEMPMED/, October 14, 2017. US. Bureau of Labor Statistics, Civilian Labor Force Participation Rate [CIVPART], retrieved from FRED, Federal Reserve Bank of St. Louis https://research.stlouisfed.org/fred2/series/CIVPART/, October 14, 2017. Federal Reserve Bank of Chicago, Chicago Fed National Activity Index: Three Month Moving Average [CFNAIMA3], retrieved from FRED, Federal Reserve Bank of St. Louis https://research.stlouisfed.org/fred2/series/CFNAIMA3/, October 14, 2017. This entry was posted in Uncategorized and tagged disturbing charts on October 16, 2017 by Ted Kavadas. I find the following charts to be disturbing. 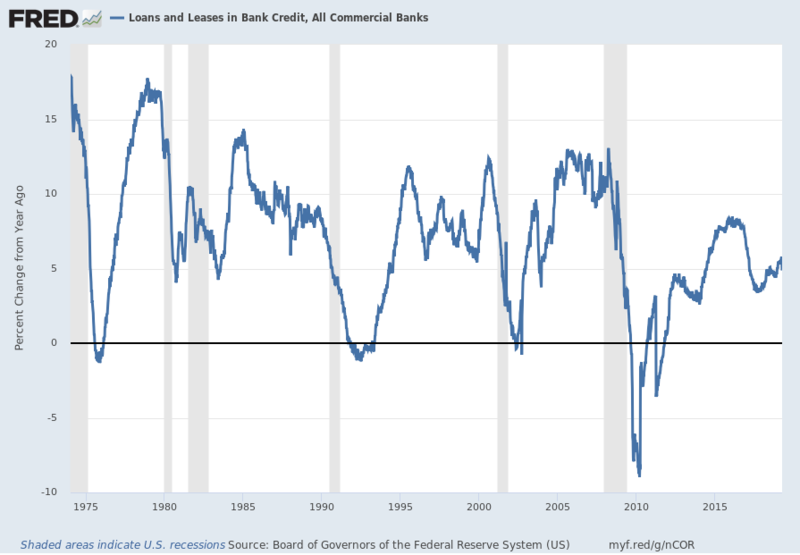 These charts would be disturbing at any point in the economic cycle; that they (on average) depict such a tenuous situation now – 97 months after the official (as per the September 20, 2010 NBER BCDC announcement) June 2009 end of the recession – is especially notable. US. Bureau of the Census, Housing Starts: Total: New Privately Owned Housing Units Started [HOUST], retrieved from FRED, Federal Reserve Bank of St. Louis https://research.stlouisfed.org/fred2/series/HOUST/, July 12, 2017. US. 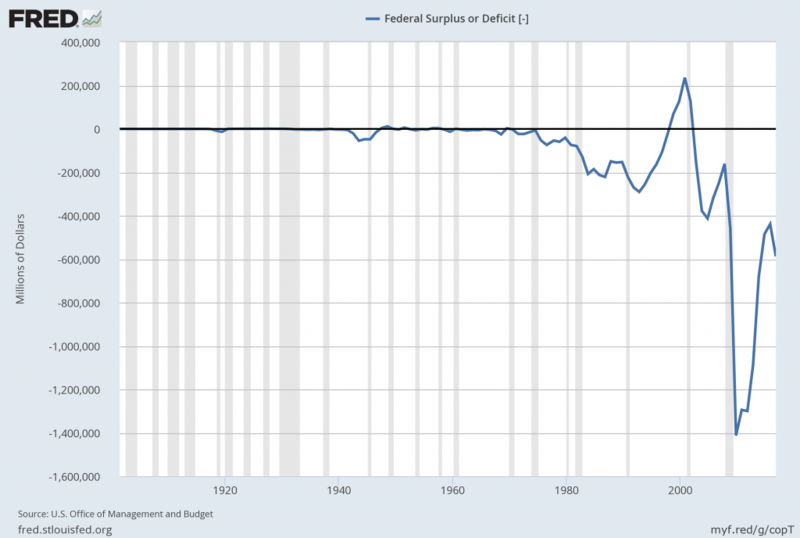 Office of Management and Budget, Federal Surplus or Deficit [-] [FYFSD], retrieved from FRED, Federal Reserve Bank of St. Louis https://research.stlouisfed.org/fred2/series/FYFSD/, July 12, 2017. US. Office of Management and Budget, Federal Net Outlays [FYONET], retrieved from FRED, Federal Reserve Bank of St. Louis https://research.stlouisfed.org/fred2/series/FYONET/, July 12, 2017. US. 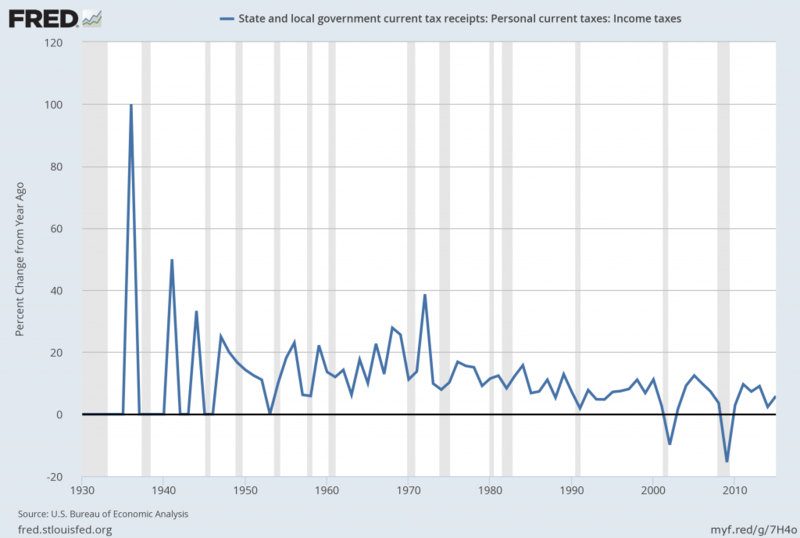 Bureau of Economic Analysis, State and local government current tax receipts: Personal current taxes: Income taxes [ASLPITAX], retrieved from FRED, Federal Reserve Bank of St. Louis https://research.stlouisfed.org/fred2/series/ASLPITAX/, July 12, 2017. 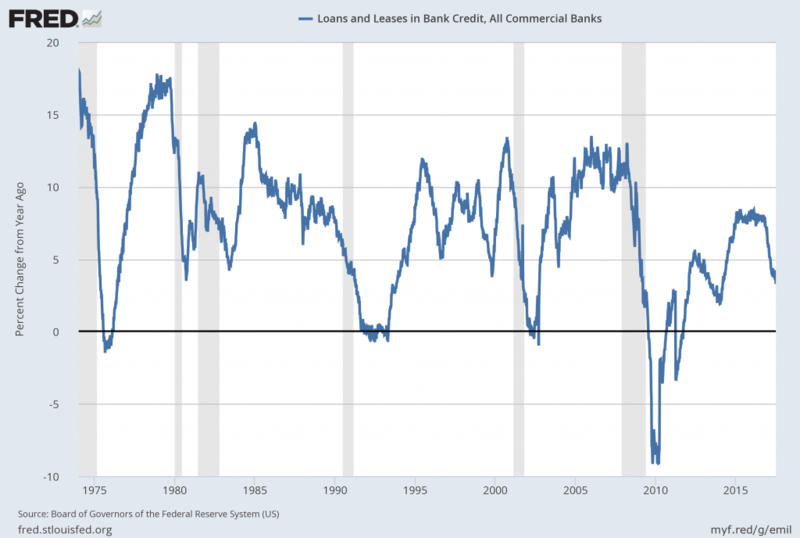 Board of Governors of the Federal Reserve System (US), Loans and Leases in Bank Credit, All Commercial Banks [TOTLL], retrieved from FRED, Federal Reserve Bank of St. Louis https://research.stlouisfed.org/fred2/series/TOTLL/, July 12, 2017. 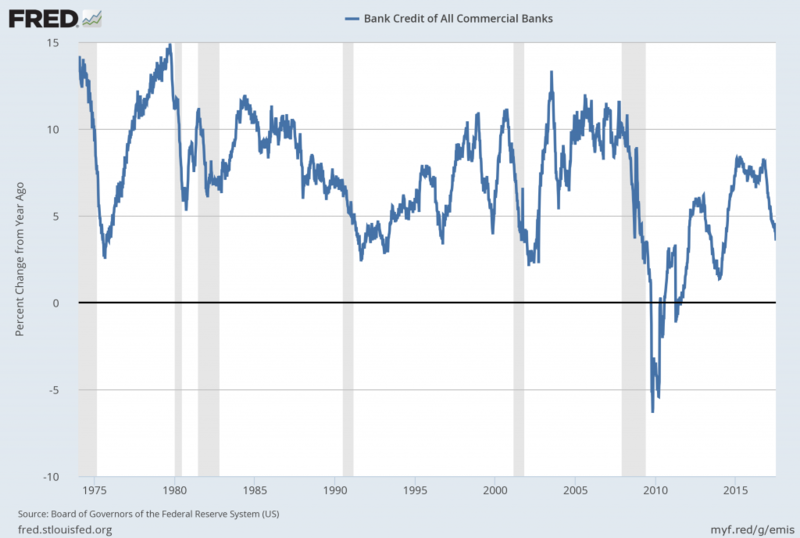 Board of Governors of the Federal Reserve System (US), Bank Credit of All Commercial Banks [TOTBKCR], retrieved from FRED, Federal Reserve Bank of St. Louis https://research.stlouisfed.org/fred2/series/TOTBKCR/, July 12, 2017. 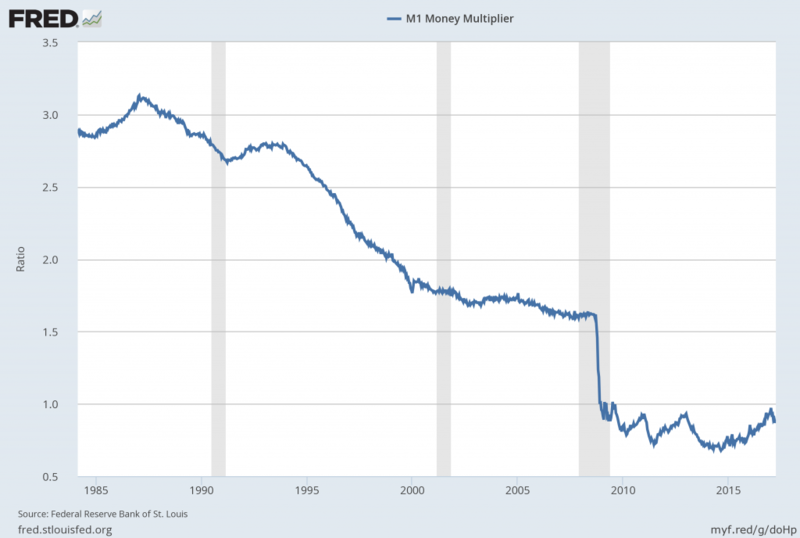 Federal Reserve Bank of St. Louis, M1 Money Multiplier [MULT], retrieved from FRED, Federal Reserve Bank of St. Louis https://research.stlouisfed.org/fred2/series/MULT/, July 12, 2017. US. Bureau of Labor Statistics, Median Duration of Unemployment [UEMPMED], retrieved from FRED, Federal Reserve Bank of St. Louis https://research.stlouisfed.org/fred2/series/UEMPMED/, July 12, 2017. US. Bureau of Labor Statistics, Civilian Labor Force Participation Rate [CIVPART], retrieved from FRED, Federal Reserve Bank of St. Louis https://research.stlouisfed.org/fred2/series/CIVPART/, July 12, 2017. 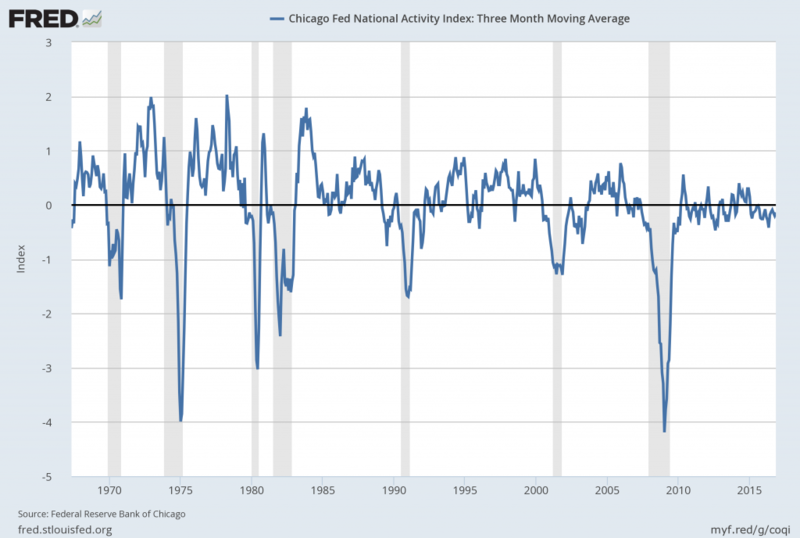 Federal Reserve Bank of Chicago, Chicago Fed National Activity Index: Three Month Moving Average [CFNAIMA3], retrieved from FRED, Federal Reserve Bank of St. Louis https://research.stlouisfed.org/fred2/series/CFNAIMA3/, July 12, 2017. This entry was posted in Uncategorized and tagged disturbing charts on July 13, 2017 by Ted Kavadas. I find the following charts to be disturbing. These charts would be disturbing at any point in the economic cycle; that they (on average) depict such a tenuous situation now – 94 months after the official (as per the September 20, 2010 NBER BCDC announcement) June 2009 end of the recession – is especially notable. US. 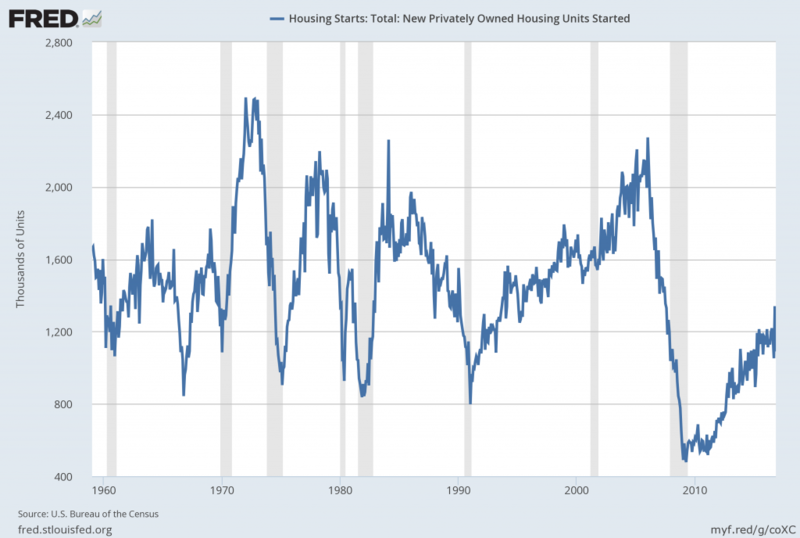 Bureau of the Census, Housing Starts: Total: New Privately Owned Housing Units Started [HOUST], retrieved from FRED, Federal Reserve Bank of St. Louis https://research.stlouisfed.org/fred2/series/HOUST/, April 17, 2017. US. 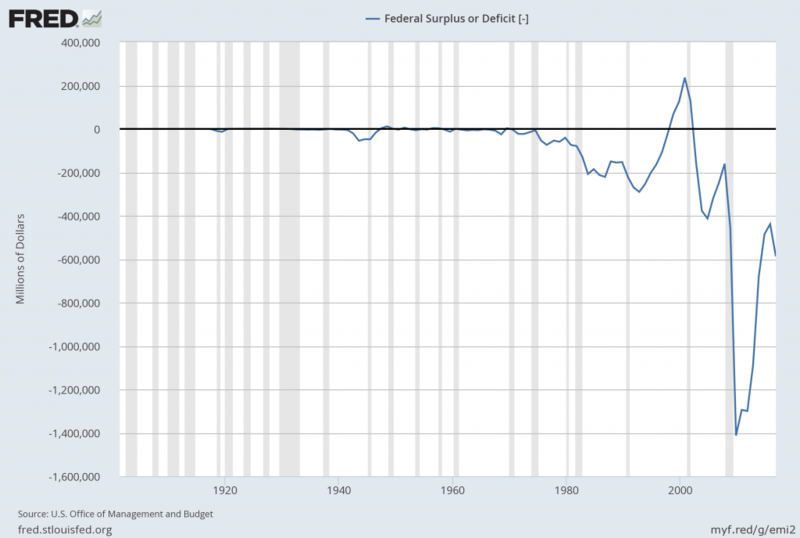 Office of Management and Budget, Federal Surplus or Deficit [-] [FYFSD], retrieved from FRED, Federal Reserve Bank of St. Louis https://research.stlouisfed.org/fred2/series/FYFSD/, April 17, 2017. US. Office of Management and Budget, Federal Net Outlays [FYONET], retrieved from FRED, Federal Reserve Bank of St. Louis https://research.stlouisfed.org/fred2/series/FYONET/, April 17, 2017. US. 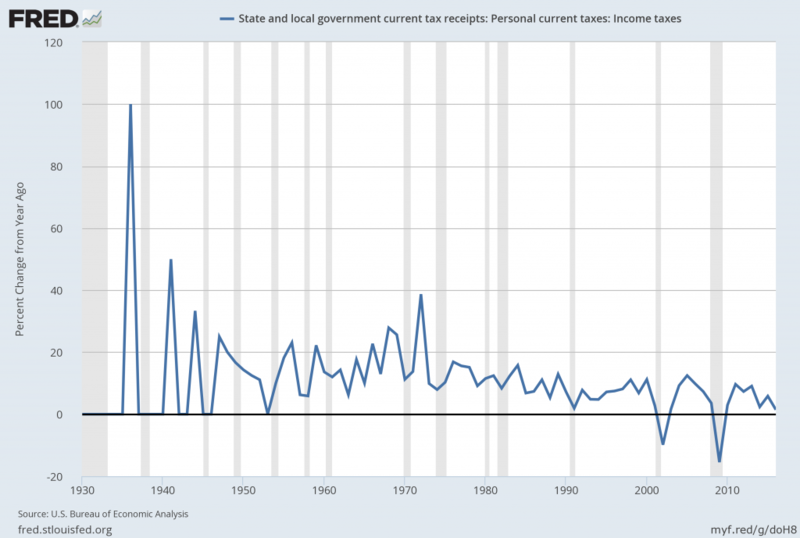 Bureau of Economic Analysis, State and local government current tax receipts: Personal current taxes: Income taxes [ASLPITAX], retrieved from FRED, Federal Reserve Bank of St. Louis https://research.stlouisfed.org/fred2/series/ASLPITAX/, April 17, 2017. 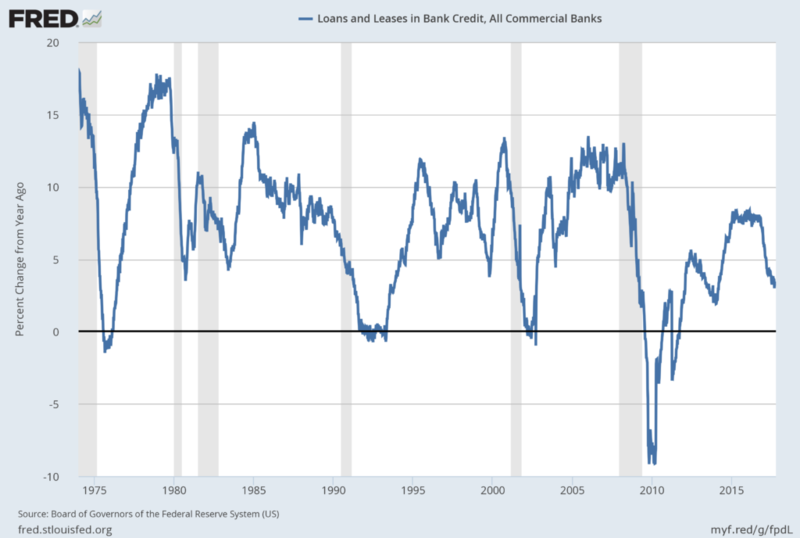 Board of Governors of the Federal Reserve System (US), Loans and Leases in Bank Credit, All Commercial Banks [TOTLL], retrieved from FRED, Federal Reserve Bank of St. Louis https://research.stlouisfed.org/fred2/series/TOTLL/, April 17, 2017. 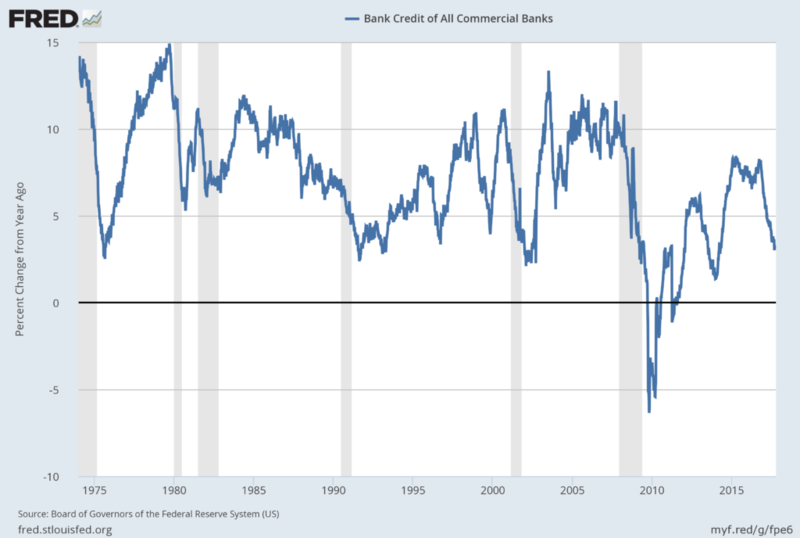 Board of Governors of the Federal Reserve System (US), Bank Credit of All Commercial Banks [TOTBKCR], retrieved from FRED, Federal Reserve Bank of St. Louis https://research.stlouisfed.org/fred2/series/TOTBKCR/, April 17, 2017. 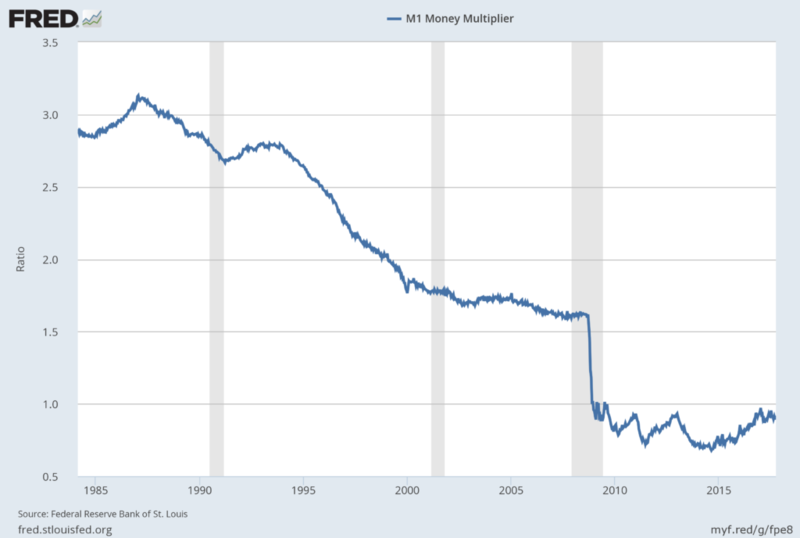 Federal Reserve Bank of St. Louis, M1 Money Multiplier [MULT], retrieved from FRED, Federal Reserve Bank of St. Louis https://research.stlouisfed.org/fred2/series/MULT/, April 17, 2017. US. 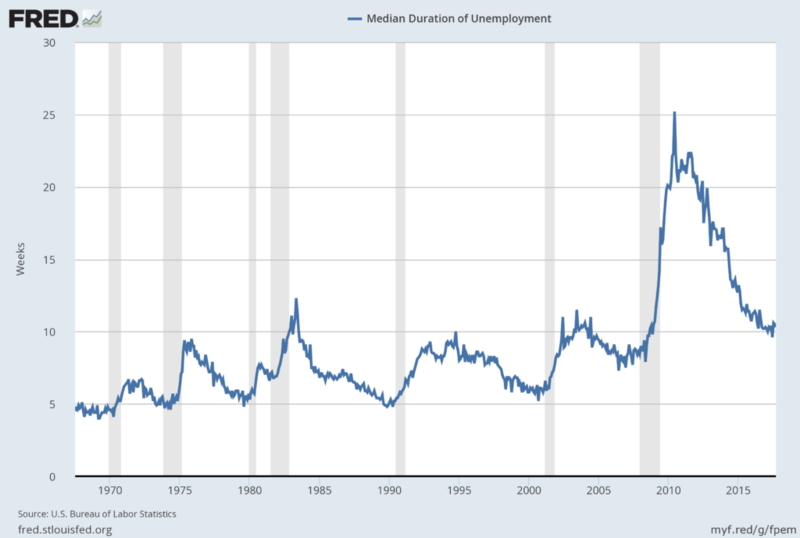 Bureau of Labor Statistics, Median Duration of Unemployment [UEMPMED], retrieved from FRED, Federal Reserve Bank of St. Louis https://research.stlouisfed.org/fred2/series/UEMPMED/, April 17, 2017. US. 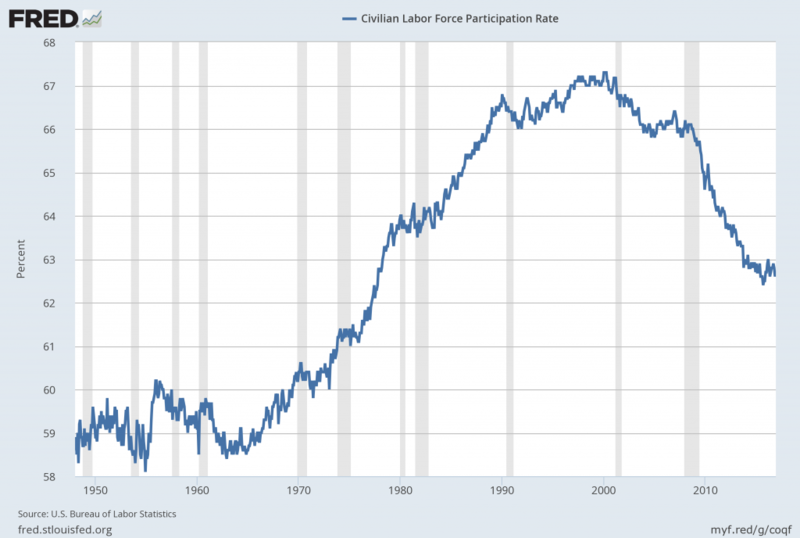 Bureau of Labor Statistics, Civilian Labor Force Participation Rate [CIVPART], retrieved from FRED, Federal Reserve Bank of St. Louis https://research.stlouisfed.org/fred2/series/CIVPART/, April 17, 2017. Federal Reserve Bank of Chicago, Chicago Fed National Activity Index: Three Month Moving Average [CFNAIMA3], retrieved from FRED, Federal Reserve Bank of St. Louis https://research.stlouisfed.org/fred2/series/CFNAIMA3/, April 17, 2017. This entry was posted in Uncategorized and tagged disturbing charts on April 18, 2017 by Ted Kavadas. I find the following charts to be disturbing. These charts would be disturbing at any point in the economic cycle; that they (on average) depict such a tenuous situation now – 91 months after the official (as per the September 20, 2010 NBER BCDC announcement) June 2009 end of the recession – is especially notable. US. Bureau of the Census, Housing Starts: Total: New Privately Owned Housing Units Started [HOUST], retrieved from FRED, Federal Reserve Bank of St. Louis https://research.stlouisfed.org/fred2/series/HOUST/, January 16, 2017. US. Office of Management and Budget, Federal Surplus or Deficit [-] [FYFSD], retrieved from FRED, Federal Reserve Bank of St. Louis https://research.stlouisfed.org/fred2/series/FYFSD/, January 16, 2017. US. Office of Management and Budget, Federal Net Outlays [FYONET], retrieved from FRED, Federal Reserve Bank of St. Louis https://research.stlouisfed.org/fred2/series/FYONET/, January 16, 2017. US. Bureau of Economic Analysis, State and local government current tax receipts: Personal current taxes: Income taxes [ASLPITAX], retrieved from FRED, Federal Reserve Bank of St. Louis https://research.stlouisfed.org/fred2/series/ASLPITAX/, January 16, 2017. 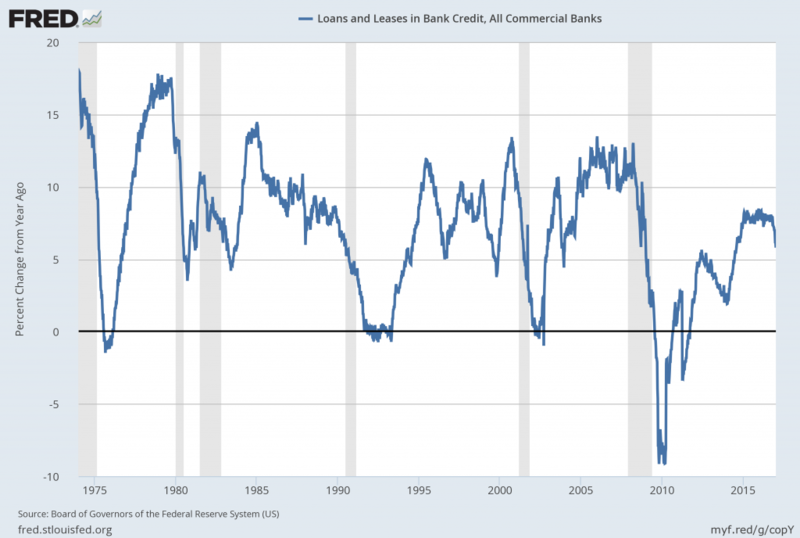 Board of Governors of the Federal Reserve System (US), Loans and Leases in Bank Credit, All Commercial Banks [TOTLL], retrieved from FRED, Federal Reserve Bank of St. Louis https://research.stlouisfed.org/fred2/series/TOTLL/, January 16, 2017. 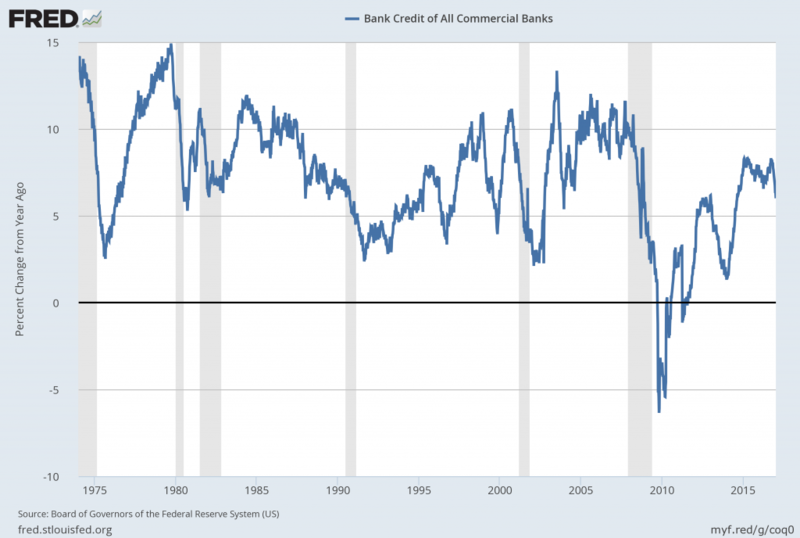 Board of Governors of the Federal Reserve System (US), Bank Credit of All Commercial Banks [TOTBKCR], retrieved from FRED, Federal Reserve Bank of St. Louis https://research.stlouisfed.org/fred2/series/TOTBKCR/, January 16, 2017. 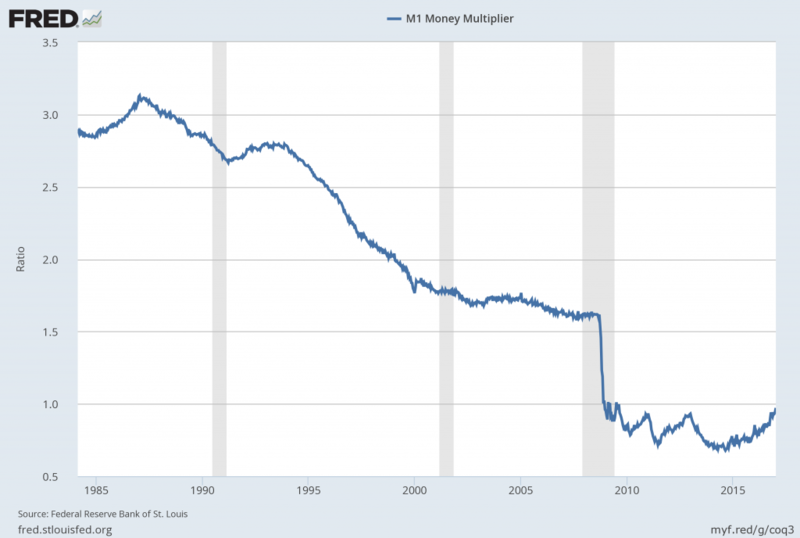 Federal Reserve Bank of St. Louis, M1 Money Multiplier [MULT], retrieved from FRED, Federal Reserve Bank of St. Louis https://research.stlouisfed.org/fred2/series/MULT/, January 16, 2017. US. 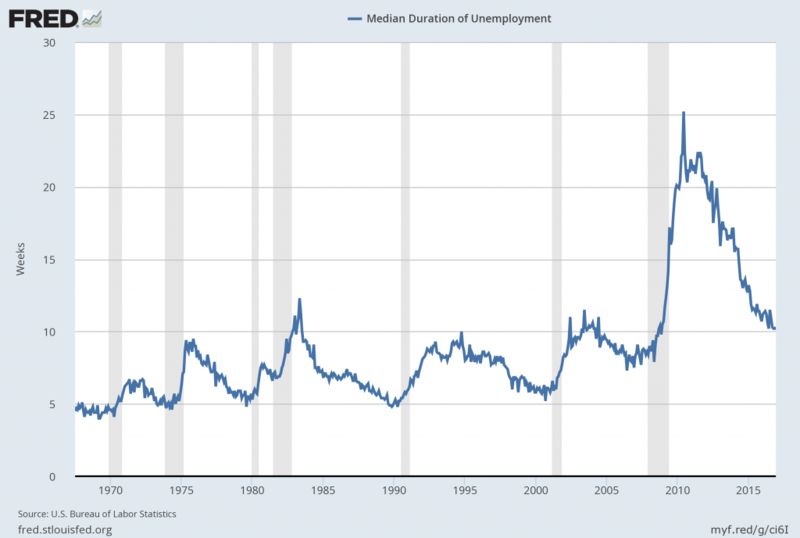 Bureau of Labor Statistics, Median Duration of Unemployment [UEMPMED], retrieved from FRED, Federal Reserve Bank of St. Louis https://research.stlouisfed.org/fred2/series/UEMPMED/, January 16, 2017. US. Bureau of Labor Statistics, Civilian Labor Force Participation Rate [CIVPART], retrieved from FRED, Federal Reserve Bank of St. Louis https://research.stlouisfed.org/fred2/series/CIVPART/, January 16, 2017. Federal Reserve Bank of Chicago, Chicago Fed National Activity Index: Three Month Moving Average [CFNAIMA3], retrieved from FRED, Federal Reserve Bank of St. Louis https://research.stlouisfed.org/fred2/series/CFNAIMA3/, January 16, 2017. This entry was posted in Uncategorized and tagged disturbing charts on January 17, 2017 by Ted Kavadas.